Elina Vähälä | Dispeker Artists, Inc.
Born in the United States and raised in Finland, Elina Vähälä made her orchestral debut with Sinfonia Lahti at the age of twelve and was later chosen by Osmo Vänskä as the orchestra’s “young master soloist”. Since that time, her career has continued to expand on international stages, winning praise from audiences and musicians alike as “a fluent, stylish and gifted musician whose brilliant technique is matched by an abundant spirit, sensitivity and imagination” (Chicago Tribune). Season highlights for 2017/18 include debuts with the Orchestre National de Lyon, Polish National Radio Orchestra, Singapore Symphony and Royal Stockholm Philharmonic and performances with the Finnish Radio Symphony, Minnesota Orchestra, Lahti Symphony, Shenzhen and Quingdao Symphony Orchestras, Niederrheinische Symphony and the Seoul International Music Festival. Recent appearances include highly succesful debuts with RTÉ National Symphony, Yomiuri Nippon Symphony, Strasbourg Philharmonic and Gävle Symphony and performances with Helsinki Philharmonic, NorrlandsOperan Symphony, Detroit Symphony, Houston Symphony and Buffalo Philharmonic orchestras. 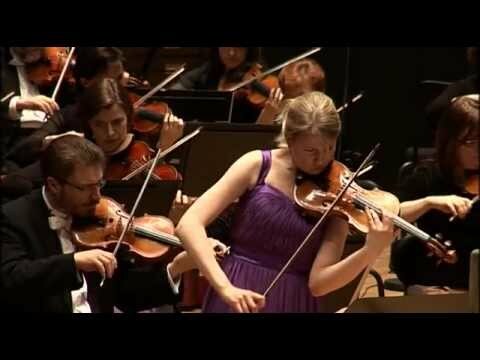 In November 2014, violinist Elina Vähälä made her Detroit debut with the Detroit Symphony Orchestra, performing John Corigliano’s cinematic 'Red Violin' concerto. PBS features the performance on its 'Detroit Arts' program, which can be viewed at the related link. When a violin and a double bass perform chamber music together, it is a case of two instruments encountering each other when normally they are poles apart and play together only alongside additional parts and colours. This is where the composers who have come forward for this adventure of a violin and double bass duo link in: should contrasts be accentuated, or should the two parts be united to form one "super-instrument", as Erkki-Sven Tüür had in mind? Should the two instruments be protagonists in a "narrative", or do they appear as representatives of fundamental principles of human nature - as in the yin and yang, as drawn upon by the Korean composer Isang Yun? Whichever path is chosen, pairing the violin and the double bass is so fascinating that even busy composers such as Krzysztof Penderecki and Wolfgang Rihm have written magnificent and highly individual pieces for this combination.